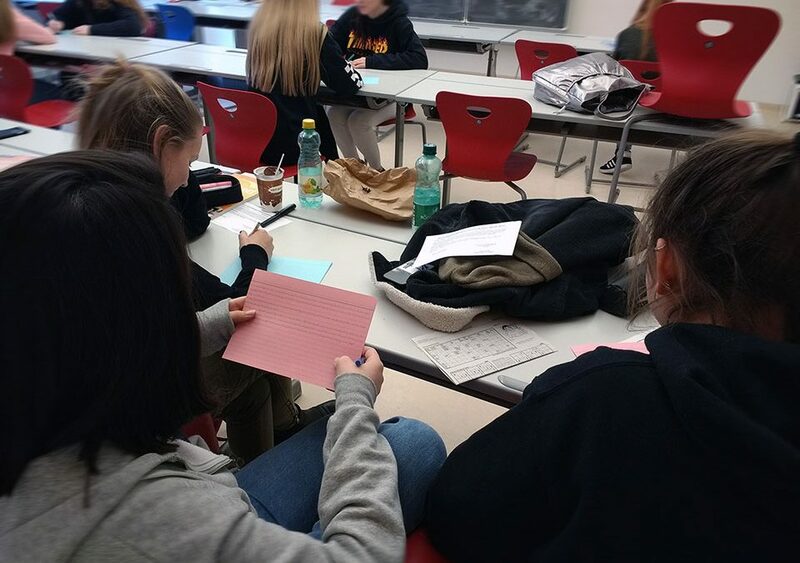 In January and February 2018, multiple digital storytelling workshops were conducted at HLW Sozialmanagement, a Caritas private secondary school for economic professions in Graz, Austria. Overall, 58 students between the ages of 14 and 16 old and from four different classes produced 58 digital stories. The workshop took place over the course of three consecutive school weeks during English class. There were 7 units à 50 minutes reserved for work on the digital stories in class and students were required to complete some work at home as well. First, the students brainstormed a number of story ideas and developed the best idea into a full story script. Then, they looked for fitting images for the story and the teacher helped correct any grammar and vocabulary mistakes in the scripts. The students were also introduced to issues related to copyright law and ownership. Following this, they used various hardware devices such as mobile phones, tablets or laptops as well as various (web) applications such as knovio.com, Microsoft PowerPoint and iMovie to record and edit their digital stories. Finally, they submitted their videos. At the end of the workshop, there was a screening of all digital stories in the classroom. Every student received feedback from two classmates after the screening of their story. The themes of the final videos were very varied and included cultural, social, personal and other topics. After the workshop and the screening concluded, students were asked to provide anonymous feedback to a specific set of questions. Most students replied that, overall, they were happy with how their own digital story had turned out. Many replied that other students should definitely also get the chance to produce their own digital story. They reported that the most difficult and time consuming part of the workshop was related to coming up with a good story idea and subsequently writing a high quality script. Many students were very critical of their stories or reading performance, specifically with regards to not liking their voice or pronunciation. Some mentioned that they were surprised by the positive feedback they received from their classmates. From an educator’s perspective, this workshop was a tremendous success. Throughout the workshop, the vast majority of students was highly motivated and focused on delivering a good outcome (i.e. digital story). They engaged with the English language primarily productively: they wrote story scripts, they recorded their voice-overs and they gave written feedback to classmates and the teacher. At the same time, students needed to engage with technology and copyright topics in various ways in order to be able to create their digital story and thus trained their media and internet literacy skills. Furthermore, they engaged with a part of their own (family) life and identity in more detail and found out new things about their classmates they had not known before, thus increasing their awareness of the personal and cultural diversity within their classroom.